I’ve been in love with some fig newton knockoffs for some time. I first experienced them from the bulk bin Berkeley Bowl and now find them in mostly unlabeled cartons around town – from where do they come? Who makes them? I have no idea, but I’ve invested some serious dollars in them over the years. 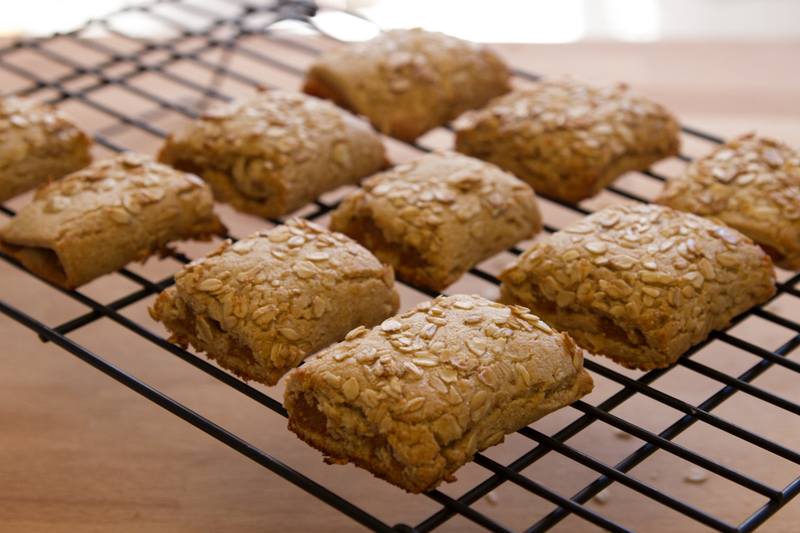 It’s been on my to-do list to try making them for awhile, and having them as a breakfast bar option seems perfect for my baby juggling mornings. These are the result of some experimentation with fig newton knock-off recipes, with some attempt at healthfulness (because it’s OK to eat these for breakfast if they’re not cookies, right?) Plus an homage to Firefly/Serenity because I’m a nerd at heart and the name is perfectly descriptive of what these are! Maybe I should start a series of recipes for fictional foods? 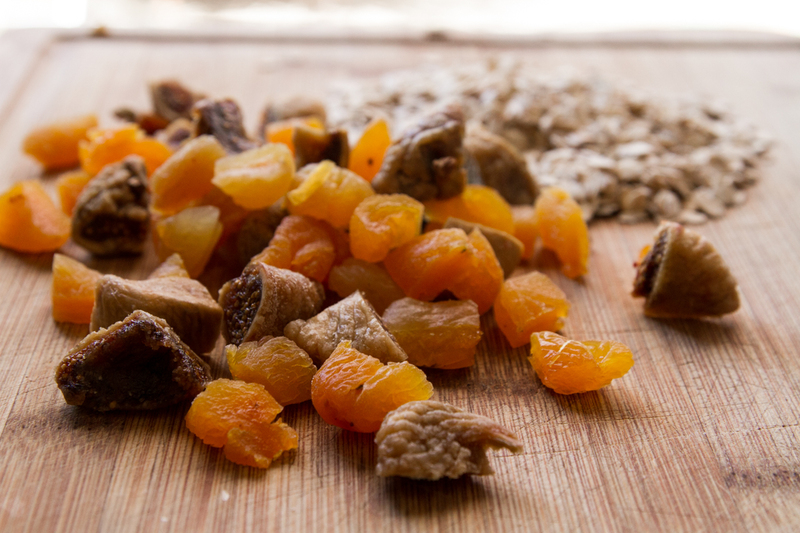 If you don’t have dried fruit, a mixture of 1/3 fresh berries, 1/3 of the granola as described below, and 1/3 chopped nuts works well. Walnuts would give an extra protein and omega-3 boost. *You can use whole wheat flour or all purpose white flour. White whole wheat is a more tender than regular whole wheat flour. I like the King Arthur Brand. Rough chop your fruit and cover with hot water to soak 10-15 minutes. Drain the fruit, pressing excess water out. Add the fruit to a food processor and process until it forms a paste. Taste and sweeten if desired. I suggest a spoon of honey at a time. In a stand mixer with the beater attachment, combine butter (cut into chunks), and sugar until creamed. Add in the flours, vanilla extract, and salt and stir until a dough forms. Chill the dough slightly; overnight is OK. However, the dough is considerably easier to work with when not too cold so if you chill overnight, bring it out of the fridge about 20 minutes before you work with it. When ready, divide your dough into 4 sections. Roll a section between two sheets of parchment paper (this will prevent it from sticking to your working surface) into 1/4″ thickness. Trim the sides with a knife into a 12”x4” rectangle. 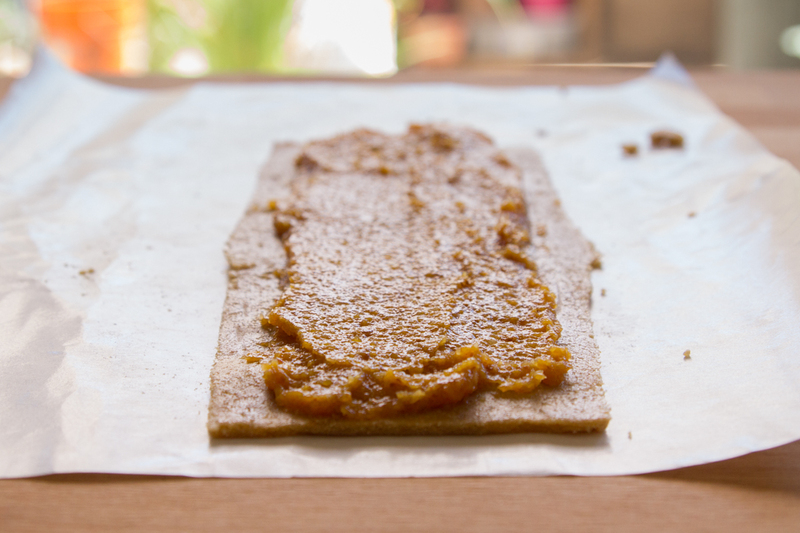 The dough will be crumbly so you can press it into the general shape before flattening with your roller. Return the trimmings back with the unused portions of the dough and chill as you work with each section. 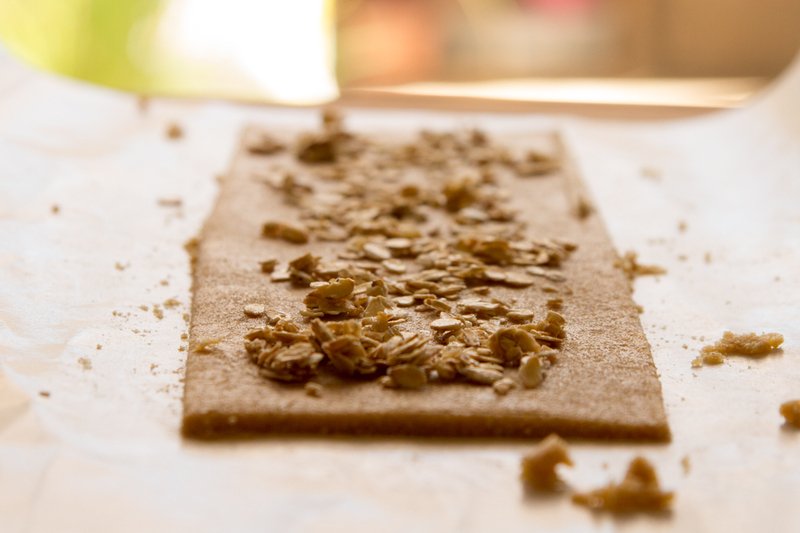 Remove your top sheet of parchment paper and sprinkle granola onto the top of your rectangle. 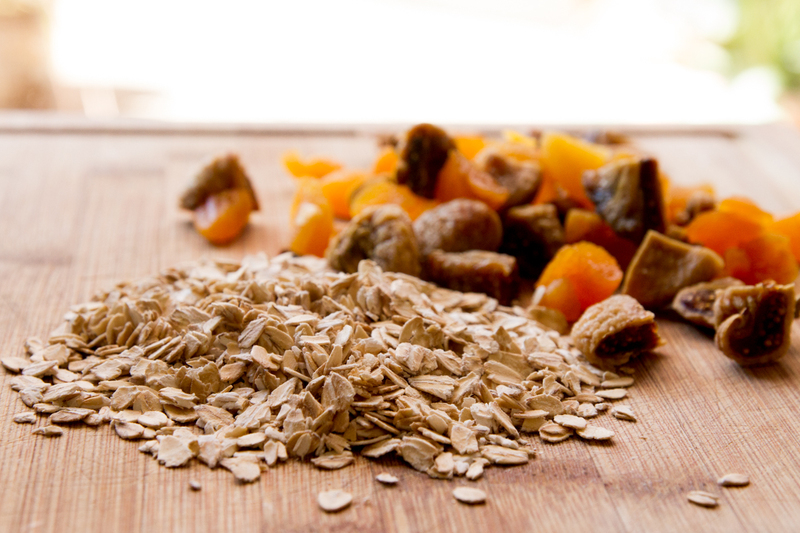 Replace the top sheet of parchment and lightly roll to press the oats into place. With a sheet on either side of your dough, carefully flip it so the granola is on the bottom. Remove the top sheet of parchment paper and spoon fruit filling to within ½” of the edge. I find 1/4″ a good thickness of fruit filling. Using the paper to help you (use the paper to lift the dough so your don’t have to touch it directly), fold over the long edges of the dough, overlapping by at least 1”. This is quite similar to rolling sushi; smooth into a bar shape by running your hands along the length of the paper. Turn the bar with the fold side down place onto a baking sheet lined with parchment paper. Repeat with the rest of the dough and filling until you have 5 long bars. (Your original 4 sections plus all the trimmings). If you can, chill the bars for a few minutes (or even pop the whole baking pan into the freezer). 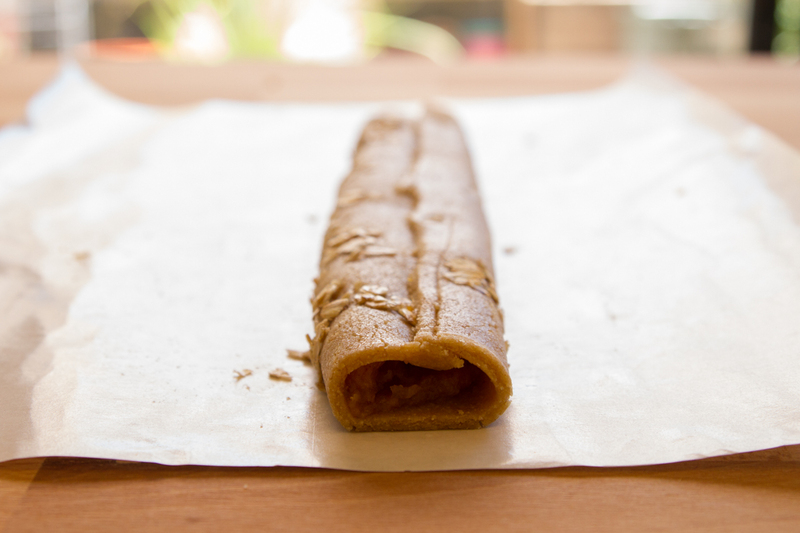 Cut the long bars into 2″ pieces, leaving about an inch of space between each piece on the baking tray. These cookies don’t spread. 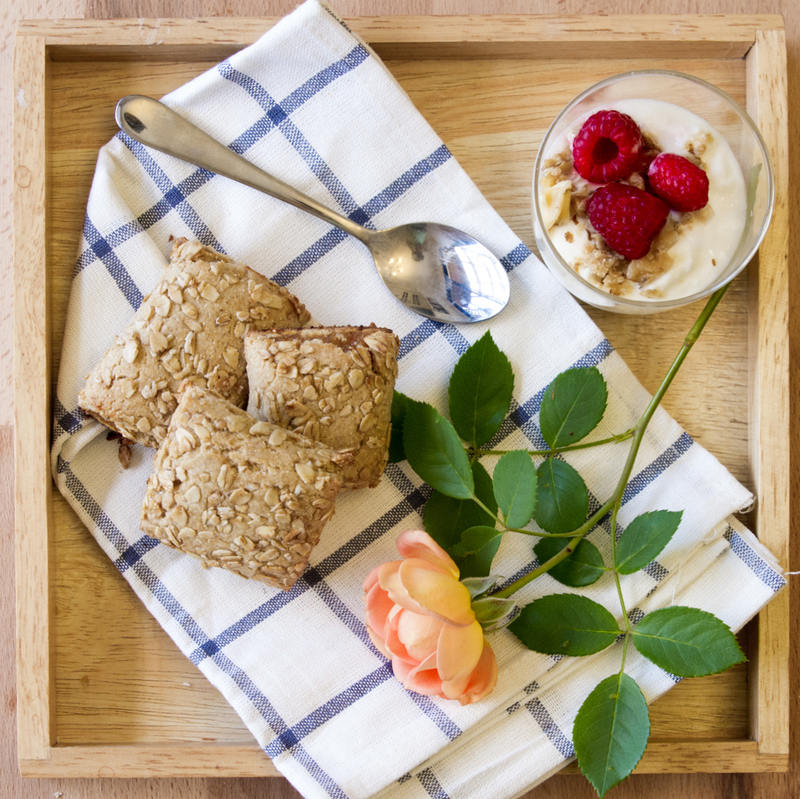 You can toast any unused oats to make your own granola on the side! Great on yogurt or just as a snack. Bake at 350 degrees for 20 minutes, checking at the 15 minute mark. Bars should golden brown at the edges when done. Cool on a rack and store in an airtight container for up to a week.